Like any proud parent engaged in the conception and birth of a child, I’ve happily watched Flowers Communications Group – and the wonderful group of talented marketing communications professionals who’ve successfully counseled our clients — grow, develop and mature over the years. And, with the horticultural nature of our name, we have literallybloomed! Every day, I look across the office at the various account teams and their ever-evolving expertise – from social media and content management to strategic media outreach to event execution, graphic design and blogger relations. And, while we’re always on the grind to move the multicultural communications needle toward positive business results, I often wonder if we realize how superbad we are. Our energy and fresh perspective combined with our cultural fusion model℠ are second to none, and it shows in the award-winning work we do: whether it’s developing marketing strategies to help McDonald’s owner operators to increase sales in Chicagoland and Northwest Indiana; driving business for MillerCoors’ brands, while they support the community; using social outreach to introduce Aio, a new wireless brand, and launch its merger with Cricket Wireless; developing creative messaging for the Federal Reserve Bank of Chicago’s outreach to minorities and women; working with Honda to celebrate the strong traditions of historically black colleges and universities; enhancing the profile of ComEd and Wells Fargo among multicultural media and customers; or partnering in the development of creative, impactful commercials for the Illinois Department of Transportation. Flowers Communications Group is doing superior work for an impressive roster of client partners. It’s been 23 years, but we’ve got more seeds to plant and buds to nurture, like our revamped website scheduled to launch this summer. For Flowers Communications Group, greater, epic days are ahead…just watch! 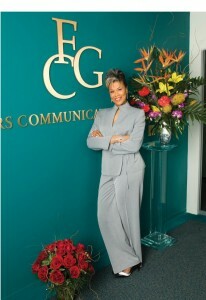 Michelle Flowers Welch is the Chairman & CEO of Flowers Communications Group. « When Keeping it “Real” Goes Wrong.